H. Moser & Cie. exhibits entrepreneurial flair with the creation of the Venturer Tourbillon Dual Time, an elegant watch bringing together very rare elements. The automatic manufacture calibre HMC 802 uses the first tourbillon ever developed by H. Moser & Cie. This tourbillon is like no other thanks to two ingenious features invented by H. Moser & Cie. Firstly, the state-of-the-art Straumann Double Hairspring® further improves the accuracy and isochronism of the new in-house manufacture movement. Secondly, the Moser Interchangeable Tourbillon Module facilitates servicing with a unique construction. The result: the perfect combination of elegant and functional design. The Venturer Tourbillon Dual Time is a very rare timepiece. Its design is infused with elements from traditional pocket watches and the 1920s Bauhaus era, and it features a convex crystal seen in watches of the 1960s. The choice of features and functions is inspired by Heinrich Moser’s professional ventures in St. Petersburg, Russia, where the young Moser created complicated pocket watches for the Imperial Court. The Venturer Tourbillon Dual Time incorporates an exceptional dial that is cambered towards the edge of its surface following the curve of the sapphire glass and accentuating the finishing. The swallow-shaped hands are curved to follow the profile of the dial. Slender, elongated applied hour markers collaborate with the hour and minute hands to impart time with notable legibility. The bottom portion of the dial is stepped lower and features chamfering between the two surfaces to highlight the two dial levels. The resultant mien delivers a highly sophisticated, refined impression. The minute tourbillon, positioned at 6 o’clock, entices the eyes to view the inner workings of the automatic movement, the manufacture calibre HMC 802, visible behind the polished, open-worked tourbillon bridge. The crystal is convex in profile, accentuating the dial and tourbillon. The dual time function is provided with an additional red hour-hand conveying the travel time, when needed. In keeping with the reserved character of H. Moser timepieces, the red hand can be hidden from view when it is not required via the crown. The crown features the Moser “M” and the curved lines of the satin-brushed area embellish the case band adjacent to highly-polished, sinuously-recessed flanks. The short horns entice the hand-stitched alligator strap and 18-carat gold folding clasp into a secure, comfortable union between the wearer and his cherished timepiece. The HMC 802 is introduced with the Venturer Tourbillon Dual Time. This movement represents another milestone for H. Moser & Cie., the entrepreneurial company that demonstrates ingenuity and technical excellence. Featuring a minute tourbillon, a dual-time function and a convenient self-winding system, the Tourbillon Dual Time runs at a frequency of 21,600 vibrations per hour. The unique construction of the Moser Interchangeable Tourbillon Module includes a Straumann Double Hairspring®. Indeed, it is this latter aspect which bestows enhanced accuracy and isochronism, two inherent qualities of the HMC 802. With its Moser Interchangeable Tourbillon module, the HMC 802 features a world first, harnessing “blue-sky thinking”. The module is assembled and regulated independently of the movement, with a simple “plug-and-play system”, facilitating servicing by a competent watchmaker without requiring tourbillon expertise. When the tourbillon was conceived in the 18th century for use in a pocket watch, the complication negated the effect of gravitational forces. The result conferred enhanced accuracy when the watch was held in a vertical plane. This is an objective which remains valid to this day. However, wristwatches are held in a multitude of positions in ordinary use, hence some of the benefits of a conventional tourbillon are lost. The Straumann Double Hairspring® ingeniously optimises accuracy with a pair of matched hairsprings, which the gravitational influence on each spring being countered by the opposing spring, irrespective of the position of the timepiece. This allows the centre of gravity to remain in the middle of the hairsprings, improving accuracy. In addition, the paired Straumann Hairsprings® also reduce the effect of friction normally experienced with a single hairspring, improving isochronism. 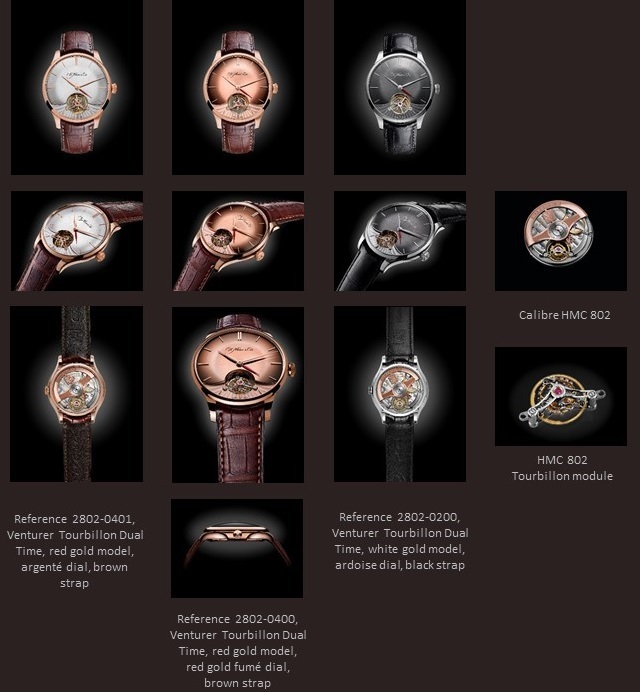 The result is a tourbillon more applicable to the needs of wearers in the 21st century. This critical component of the movement was developed together with Precision Engineering AG, a sister company of H. Moser & Cie. specialised in the development and production of hairsprings and escapements, at the same premises in Neuhausen am Rheinfall. This innovative double hairspring technology is featured in a limited number of other H. Moser timepieces. To power the movement automatically, a bi-directional pawl winding system transfers the energy from the 18-carat solid red gold rotor to the barrel. The system energises the mainspring when turning in either direction, reducing the time required to fully wind the watch. The HMC 802 has a minimum power reserve of three days. The red-gold rotor features the H. Moser company hallmark and is open-worked to view the movement below. The rhodium-plated movement includes chamfered bridges, decorated with the famous Moser stripes and gold engraving. There is a deliberate gap between the bridges for a better view of the circular grained wheels of the gear train, indulging purists’ eyes with a view of the flawless finishing of the movement. The exceptional design of the tourbillon as a module, along with the open-worked tourbillon bridge and the screwed balance, stands testament to the no-compromise creation of the HMC 802. The H. Moser & Cie. Venturer Tourbillon Dual Time represents the culmination of handsome, yet refined aesthetics and reveals a miniature mechanical world. It harnesses complications which enhance functionality. The mechanical ingenuity employed improves accuracy, isochronism and ease of servicing, and the fine craftsmanship confers years of enjoyment. Indeed, it is this array of attributes which makes this watch very rare.